Dr. Sonny Kim received his Bachelor’s degree in Biochemistry from the University of Virginia, and went on to complete his dental studies at the Tufts University School of Dental Medicine. After graduation, Dr. Kim went on to complete his residency at the U.S. Air Force Residency Program at Scott Air Force Base in Illinois. During his residency, he learned from specialists in prosthodontics, endodontics, pediatric dentistry, oral surgery and other specialties, giving him a wide and comprehensive education in the various fields of dentistry. Following residency, Dr. Kim was stationed at Osan Air Base in Korea, then Andrews Air Force Base in Maryland. In 1996, Dr. Kim opened his own private practice with his wife and office manager, Helen Kim. 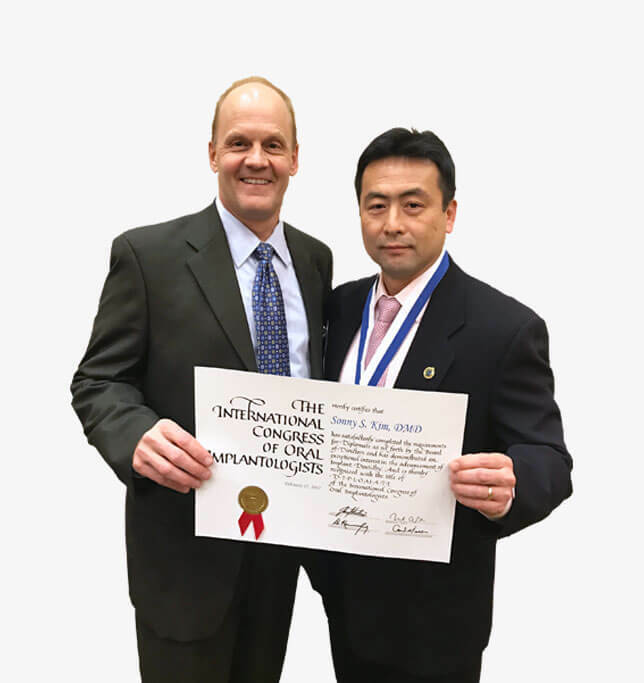 He passionately continues to study advanced methods of dentistry and dental treatments in order to provide the highest-quality services to his patients. Outside of the office, Dr. Kim enjoys spending time with his wife and two daughters. The family shares a deep passion for soccer, and both of his daughters have played for local teams since they were 5 years old. Dr. Kim has also been a soccer coach for his daughters and the community, and continues to be active in the 50+ league. Their favorite pastimes are cheering for FC Barcelona, fishing, and hiking.